DALLAS, June 25, 2018 /PRNewswire/ -- The EnLink Midstream companies (EnLink), EnLink Midstream, LLC (NYSE: ENLC), the General Partner, and EnLink Midstream Partners, LP (NYSE: ENLK), the Master Limited Partnership, announced today that EnLink's Boards of Directors approved several changes to EnLink's executive and senior leadership teams. "EnLink is at an exciting point in our journey," said Michael J. Garberding, President and Chief Executive Officer. "We recently announced plans for a new, long-term strategic partnership with Global Infrastructure Partners, and we continue to proactively transform our company to better align our leadership team with our strategic plan and its geographically driven, cross-commodity growth strategies. These leadership changes will generate further cross-commodity focus, more efficiencies for our business, stronger customer service, and increased growth opportunities to ensure our lasting success." Benjamin D. Lamb is promoted to Executive Vice President and Chief Operating Officer. He will lead commercial and operational efforts across all of EnLink's asset areas, ensuring the successful execution of EnLink's strategic plan and seven growth strategies. Lamb joined EnLink's predecessor company, Crosstex Energy, in 2012 and has played a key role in the development and execution of the company's strategic plan, including leading several transformative acquisitions. Most recently, Lamb served as Executive Vice President of Oklahoma and North Texas, overseeing operations and commercial activity in EnLink's key supply basins. Alaina K. Brooks is promoted to EnLink's Executive Leadership Team as Executive Vice President, Chief Legal and Administrative Officer, and Secretary. She will lead several departments across the company, including legal, regulatory, human resources, public and industry affairs, and environmental, health, and safety. She continues to play a leadership role in the creation and successful execution of EnLink's strategic plan. 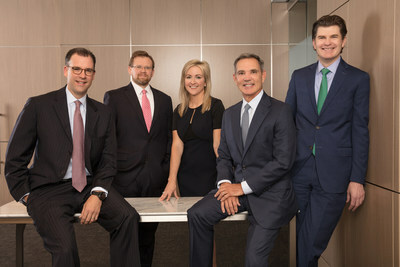 Brooks joined EnLink's predecessor company in 2008 and has filled several legal roles since that time, most recently as Senior Vice President and General Counsel. She has overseen litigation, commercial contracts, mergers and acquisitions, regulatory issues, and other legal matters while working alongside EnLink's leadership team in the execution of EnLink's strategic plan and all major company transactions. Eric D. Batchelder, Executive Vice President and Chief Financial Officer, will add corporate development to his CFO responsibilities, leading the company's strategy around investments, growth opportunities, and financing. Batchelder joined EnLink in January 2018 as Executive Vice President and CFO. He has more than 15 years of financial leadership experience in the energy sector, most recently as Managing Director, Energy Investment Banking at RBC Capital Markets, where he was responsible for transaction structuring, capital markets activity, strategic planning, business development efforts, and maintaining key client relationships for the bank's U.S. midstream energy advisory business. "Our combined executive and senior leadership teams bring considerable drive and deep expertise, and I am excited to start a new chapter in EnLink's journey with this team in place," Garberding said. "At the same time, we are thankful to Mac for his service, as he played an important role in getting EnLink to where we are today. We wish him success." This press release contains forward-looking statements within the meaning of the federal securities laws. These statements are based on certain assumptions made by EnLink Midstream Partners, LP (the Partnership) and EnLink Midstream, LLC (the General Partner) based upon management's experience and perception of historical trends, current conditions, expected future developments and other factors the Partnership and the General Partner believe are appropriate in the circumstances. These statements include, but are not limited to, statements with respect to the closing of the transaction between Devon and Global Infrastructure Partners, the addition of Global Infrastructure Partners as a part of the Partnership as well as the Partnership's future growth and results of operations. Such statements are subject to a number of assumptions, risks and uncertainties, many of which are beyond the control of the Partnership and the General Partner, which may cause the Partnership's and the General Partner's actual results to differ materially from those implied or expressed by the forward-looking statements. These risks include, but are not limited to, risks discussed in the Partnership's and the General Partner's filings with the Securities and Exchange Commission. The Partnership and the General Partner have no obligation to publicly update or revise any forward-looking statement, whether as a result of new information, future events or otherwise.